Join colleagues from around the world at the only conference specifically for professionals leading internationalization at higher education institutions. 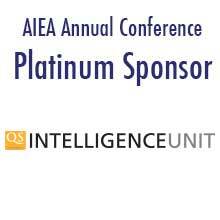 The AIEA Annual Conference brings together international education leaders to discuss trends, best practices, key strategic-level issues in the field. Explore past session topics by browsing the AIEA Session Archive. "As an SIO, AIEA is the most important conference of the year for me." "It's specifically targeted to the SIO, and many of the topics and sessions provide useful, actionable information. Together, we are putting together best practices of the profession." "It's the one conference I look forward to each year! The discussions I am able to have with colleagues always enriches my knowledge about the field and allows me to reflect critically on the state of international education administration at my institution." "This was my first AIEA conference. It was partly an exploratory effort, to see how this conference compares to, and complements, other forums where our institution participates. I found it to be particularly strong as a professional development/sector reflection space. I plan on continuing to attend."